Following the success of last year’s inaugural event, the 2016 Secret Art Sale attracted even more artists to participate – from young aspiring artists to renowned professional painters, cartoonists and illustrators. 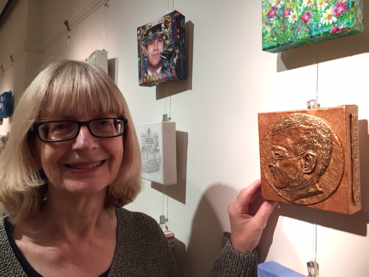 Over 170 6”x 6” canvases were submitted by 143 artists and put on display at the Upstairs Gallery at West House, Pinner Memorial Park over the weekend of 5th and 6th November. All canvases were presented anonymously for sale at the same price of £40, with all proceeds from the artworks sold going towards the new Heath Robinson Museum adjacent to West House. Artists were given free rein to paint or decorate their canvases, with some incorporating metalwork, embroidery and textile compositions. Councillor Jean Lammiman, who is also a Trustee of The West House and Heath Robinson Museum Trust, launched the Sale with a speech congratulating the artists and the volunteers who were stewarding the event over the weekend. Councillor Lammiman also introduced the Mayor of Harrow, Councillor Rekha Shah, who thanked all the contributing artists and gave special thanks to the Sale organisers Deena Dwala and Ann Kopka and sponsors, local estate agents Rawlinson Gold. Artist Shanti Panchal, a resident of Harrow who currently has a solo exhibition at the Piano Nobile, Kings Cross and exhibitor at the Secret Art Sale, said it meant a lot to him to have such an interest in art and flowering of talent on his doorstep. In addition to the stunning display of pictures, the Secret Art Sale weekend featured a Silent Auction, a raffle and the opportunity for visitors to vote for their favourite canvas in The People’s Choice competition. The Silent Auction raised several hundred pounds for a painting donated by the renowned artist and Children’s Laureate Chris Riddell. There were two marvellous raffle prizes: one a picture of Morph, an original with signature on the back, drawn and donated by Peter Lord of the Aardman Animations Studio, and another prize of a visit for six to the House of Illustration to see the Ardizzone exhibition accompanied by the Gallery’s Director. There were two runners-up People’s Choice prizes. The first was won by twice BAFTA-nominated artist and designer Pete Wane with his quirky take on “6 by 6” and a nod to Heath Robinson as well as to Christmas puddings – a theme in a number of Pete’s other canvases at the Sale. The other runner-up prize went to a blue abstract with gold by Helen Pringle. Helen lives locally and is not a professional artist: proof that local people can compete with the best! This year, there was also another award, The Curator’s Prize, kindly donated by Ann Kopka, the Secret Art Sale Curator. The winner of this prestigious award was Shirley Batten-Smith with a bronze profile of William Heath Robinson. Ann described Shirley’s artwork as “an intelligent, inventive and ingenious use of material. It reminds me of a gold medal and seems particularly appropriate in this year, the launch of the new Heath Robinson Museum”. For anyone who missed the Sale, the remaining canvases will be exhibited for sale by Rawlinson Gold in Bridge Street on Thursday 24th November as part of the Pinner Pantomime Evening. The names of all the Secret Art Sale artists along with images of all the canvases can be seen here.